Attracted by high concentrations of plankton, large numbers of whale sharks congregate each summer in the waters off Mexico's Yucatan Peninsula. In turn, large numbers of underwater photographers are attracted by the opportunity to get close to the world's largest fish. I captured the above photograph last summer on a trip specifically targeting whale sharks in the seas off the Yucatan Peninsula. The free-diving videographer in the image is Cristian Dimitrius, an award-winning nature photographer and filmmaker from Brazil. He and I had both been working with this very cooperative shark for many minutes, but Cristian didn’t know he was included in my shot when I framed this photograph. His photogenic pose is, in fact, a completely candid moment. However, after countless hours in the water with his camera, Cristian typically looks poised and fluid while diving, making him an outstanding (if unsuspecting) model. 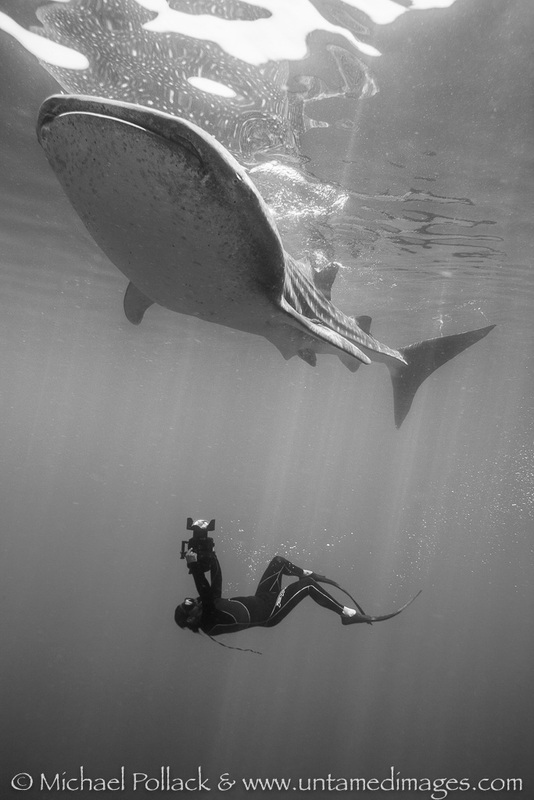 To see more whale shark images from the trip, click on this link: Whale Shark Gallery.